As the events from last week alluded to, the battle between U.A. against the world commences in the tournament. Everyone holds their ground against opponents from Ketsubutsu with some really neat powerups that range in effectiveness. One of the dudes can stiffen items, and is able to stiffen his balls (no I’m not giggling, you’re giggling, shut up) to make them more powerful and effective, while a dude who looks like Android 17 can Boomerang objects back and forth in a really cool animated sequence. 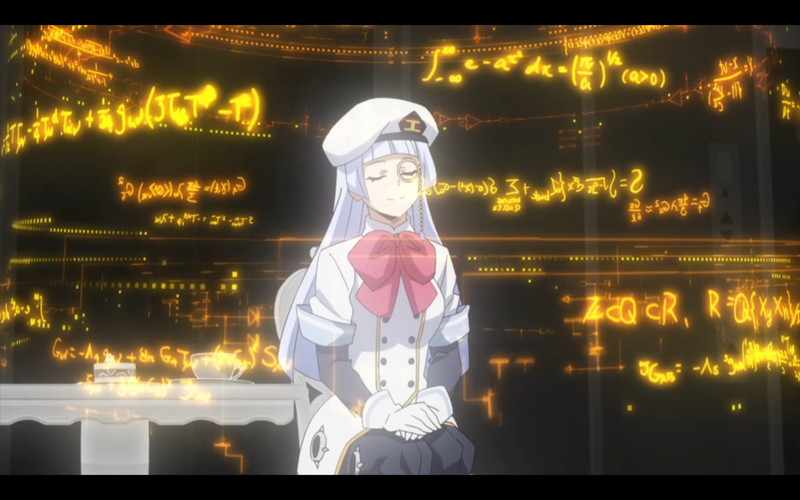 And then there’s a cutie who can fold her body in and out just like that of a turtle which is, uh….man, you really gotta wonder how some of these abilities work. The class manages to fend them off real good with new upgrades and additions to their costumes, like Jiro’s cool sound gauntlets and Mina’s Acid Veil. 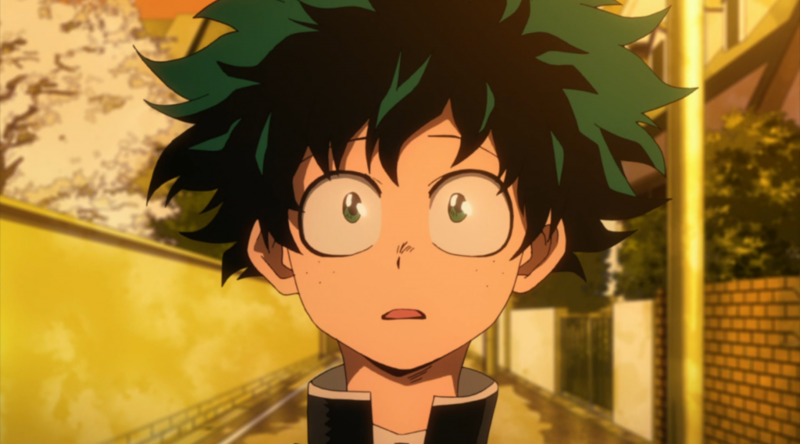 And then there’s Dark Deku Boy, Yo Shindo who’s quirk is basically to make giant earthquakes with the neat side effect that the strength of the aftershock transfers back to him. It’s a very powerful, very excessive display of strength. 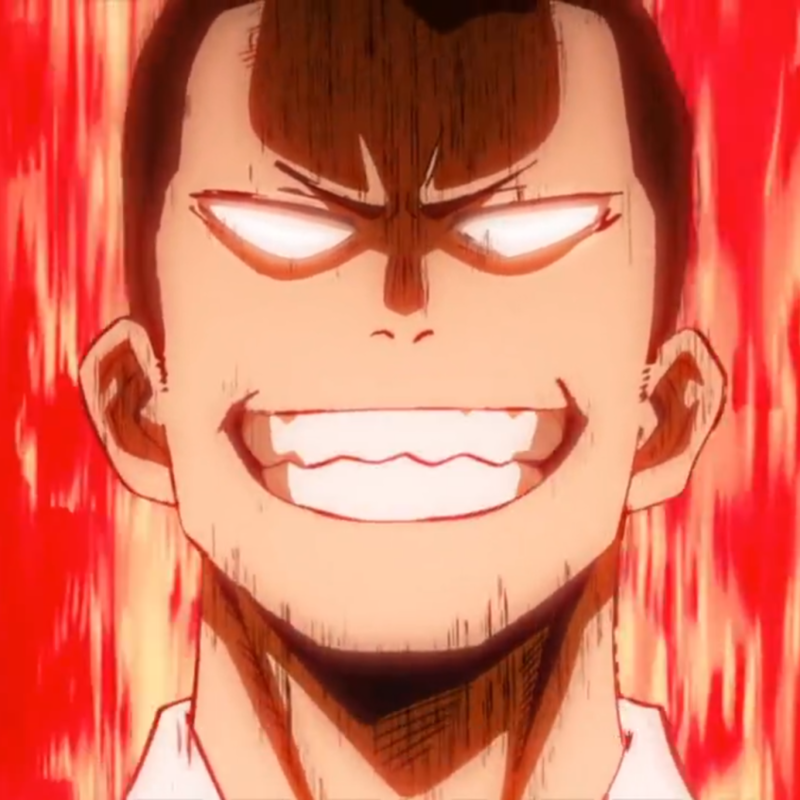 And SPEAKING of excessive displays, let’s talk Inasa. The passionate gust of wind who’s SO PASSIONATE he decides to just…steal the balls of hundreds in a giant tornado and just…knocks out 120 people in one fell swoop, showing just how strong and crazy this enthusiastic mad man really is. Time starts ticking down as people start passing the exam filling up the 100 person quota quicker than anticipated, making the entire thing feel like a real rush for time. 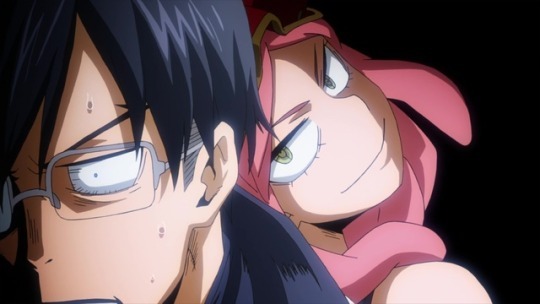 Deku finds himself recovering from the aftermath of Inasa’s attack, tangling head-to-toe with a femme fatale from Inasa’s school. She succeeds in overwhelming him, messing with him, and potentially coming on to him all in one fell, acrobatic swoop. He’s narrowly saved by everyone else coming to attack her. 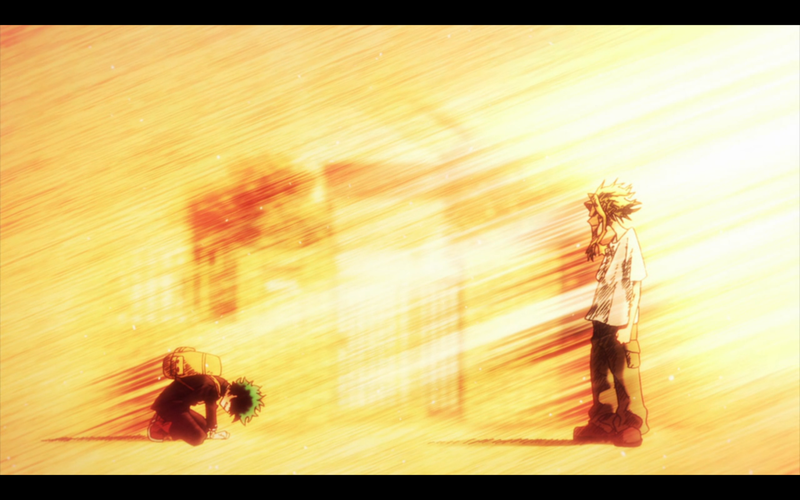 I’ll say this: as much as I enjoy this show, this feels like an episode that they definitely had to pad out a tad. They were cutting in and out of flashbacks we’ve already seen, some as recent as just a few minutes prior. 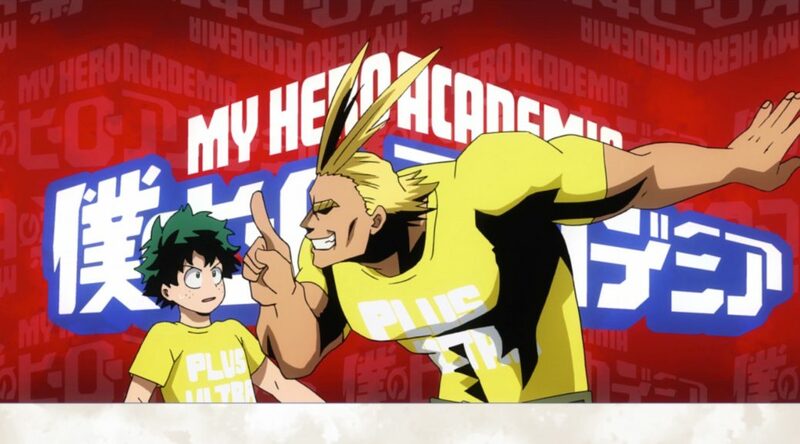 It’s not a major detriment to the show, but MHA has managed to do better than this for so long that if feels genuinely distracting when they do pad for time this way. 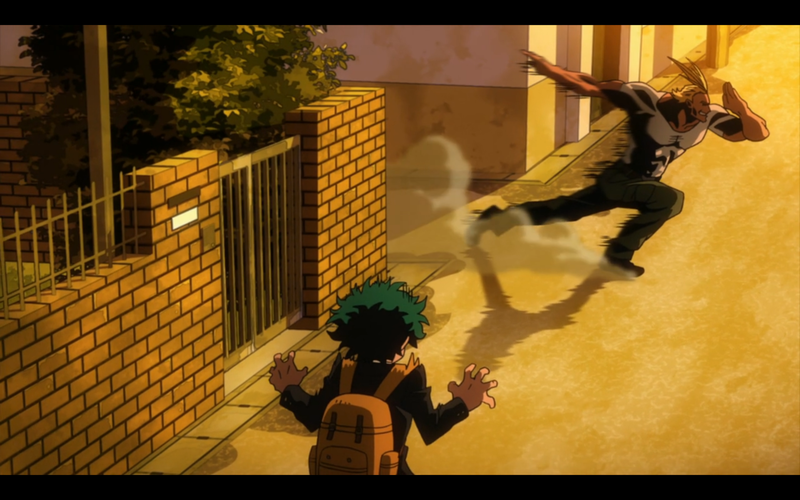 Ochaco runs away with Uraraka, but she’s on the move to ATTACK! 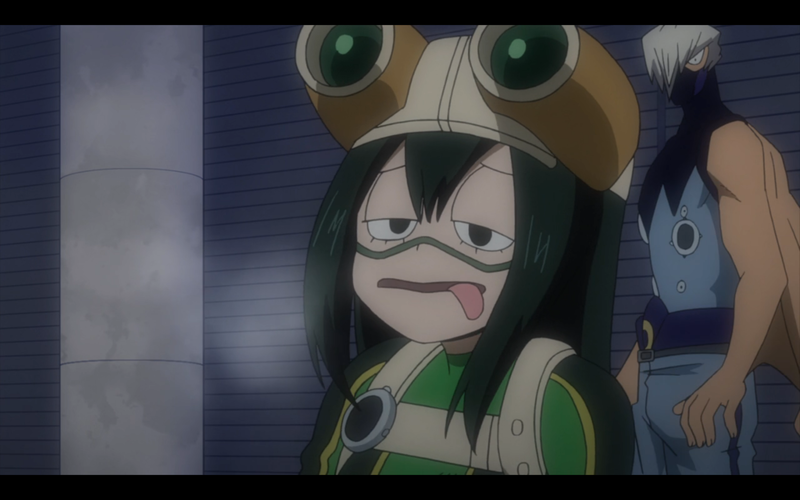 That said, Deku ain’t no dumbass and is aware that she’s trying to pull something. He KNEW that she would be able to make herself float, and wouldn’t be dumb enough to reveal herself out in the open with no plan whatsoever. 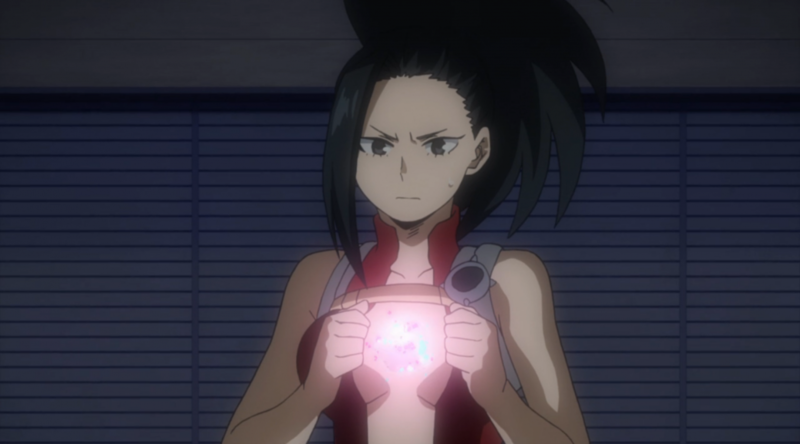 Camie, the femme fatale who had been hitting on Deku, shows off her ability to transform into other people, even if it meant transforming her clothes into an admittedly kind of awkward-looking white bodysuit (for broadcast censorship purposes, I imagine.) 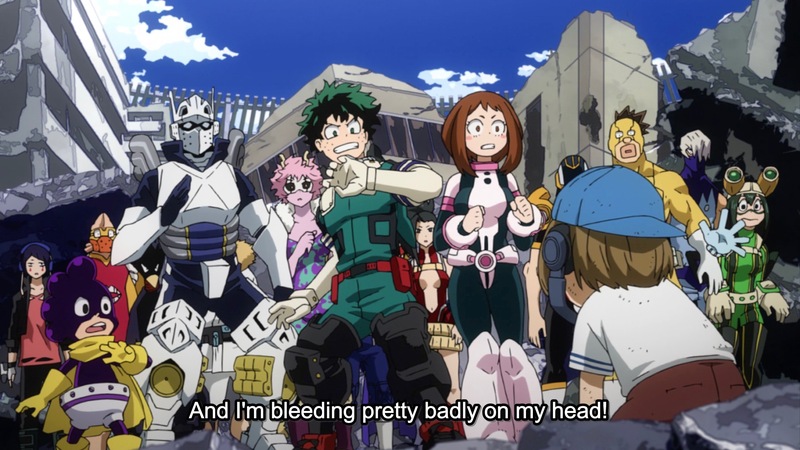 Deku is then saved by Tape Boy Sero and the real Ochaco, Uraraka, who manage to get him out of a pinch as they plan their counteroffensive. 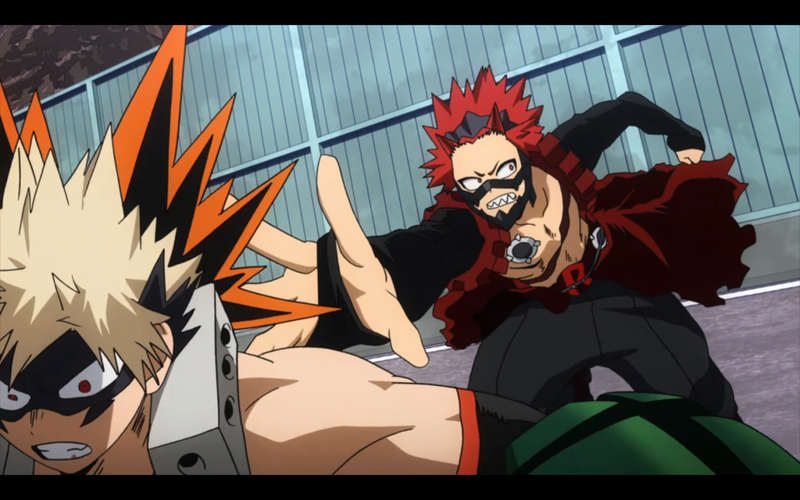 What’s interesting about the last segment with Shoto Todoroki is that it’s actually material that was not in the manga. 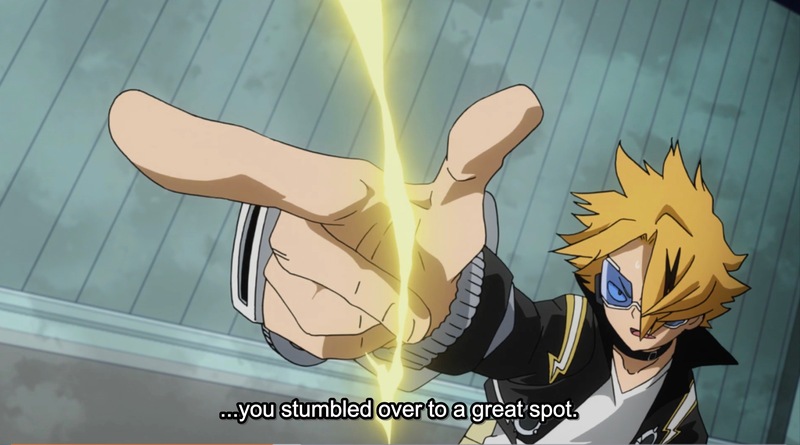 One could argue this is technically “filler” material but to be honest, in a giant tournament event where everyone is doing things on their own, there’s a fair bit of material to be explored and expanded upon. 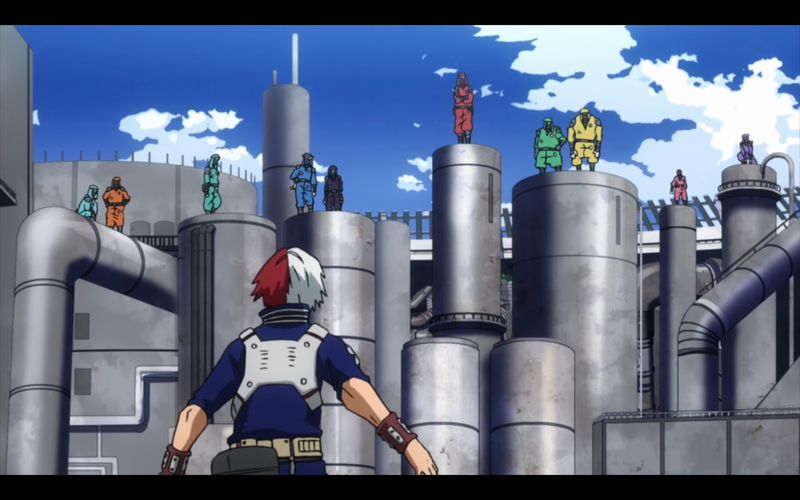 So seeing Todoroki get to face off against a ninja clan is actually pretty entertaining and cool to watch. 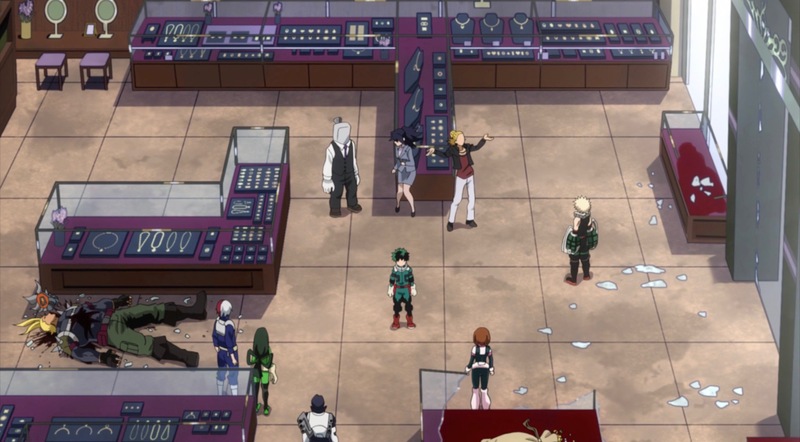 And if next week’s episode preview is to be believed, we’ll get a little more hands-on with the rest of Class 1-A as they get to do cool things on their own, and frankly, it’s ALWAYS exciting to get more of that. 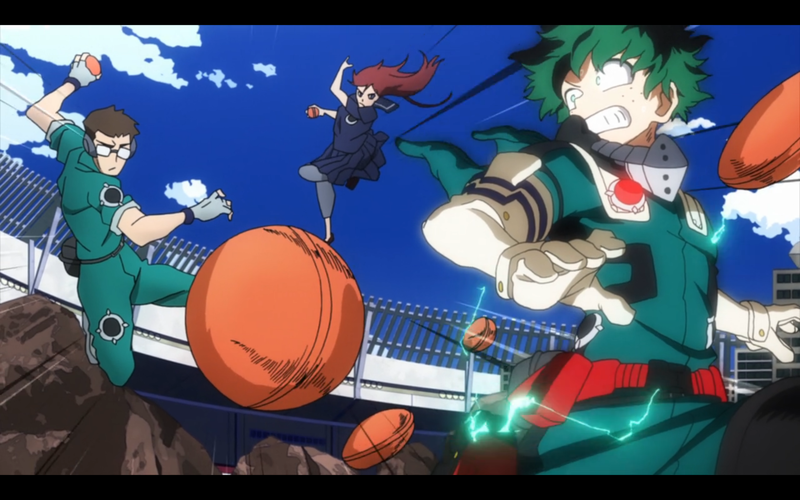 Pacing issues aside, this was still a pretty fun episode with some cool fight sequences, and I’m psyched for next week.